Great photos again and it sounds like a very nice morning walk even without all the photos you had hoped for. Hi Alan , hope you are beating the virus! It wasn't until I read your blog on cuckoo's that I realized just how in the back ground, & out of sight they like to be. All day I listen to the sound of a fan tailed cuckoo, but I've only seen it twice - both times in the company of a pair of Dusky Wood Swallows - it will be interesting to see what fledges from their nest this spring! It was indeed a great morning's birding, and I managed to keep my mind off the early affects of this virus. Orchids are always a bonus too. I gather this virus will "bug" me for a few weeks yet, but it probably won't stop me going birding. I've rather relied on knowing the calls of our cuckoos to ID them, rarely bothering to actually look for them. If it wasn't for their propensity of sitting on power lines, I think I'd rarely see them at all. They are a fascinating group of birds. It always fascinates me how the 'host' birds recognise adult Cuckoos, and mob then aggressively, and yet will feed a young cuckoo hatched in their own nest. Gives new meaning to 'bird-brained'! Great photos Alan! Sounds like a good day birding. I've lurked in these blogs and have read your posts for sometime but I have only just signed up. Keep posting! The other night we heard a cuckoo singing. 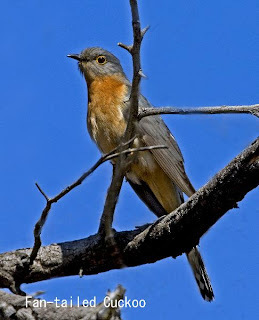 The first time we have heard a cuckoo in the twelve years we have lived in Colebrook, about 40km north of Hobart. Would anyone be able to advise what variety it would most likely be and are these birds purely nocturnal or can they be spotted during the day. Sorry for the basic questions, but we are not knowledgeable on birds, just love the idea there could be an uncommon species to these parts. I have been mulling over this for a few days. Many birds occasionally call at night, and you don't mention which cuckoo--2 candidates, Fantailed or Pallid. However since you didn't say which cuckoo, perhaps you're not familiar with our cuckoos calls, could it actually be a Boobook Owl? It's 2 note "Boo-book" is somewhat similar to the European Cuckoo's "Cuc-coo" call. Your thoughts? Following from my last post, regarding hearing what I thought was a Cuckoo the other night in Colebrook. 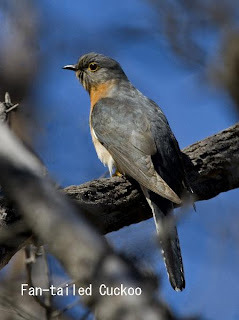 Do either the Fantailed Cuckoo or Pallid Cuckoo have a call similar to the European species ? My wife and I both distinctly heard "Cuc-coo" with a definate time gap between the "Cuc" and the "coo". We heard this call about a dozen times. Neither Fantailed or Pallid have a call that could be construed as anything like the European Cuckoo call of Cuc-coo. Hence my alternative suggestion of a bird (boobook Owl) that has a somewhat similar call (two syllables),and does call at night. I'm not saying that my suggestion is what you heard, merely that it is somewhat more likely. There are sites that have the calls of these cuckoos, I suggest googleing them. David Stewart has a CD of Tasmanian bird calls that, as far as I'm aware, is still available locally.